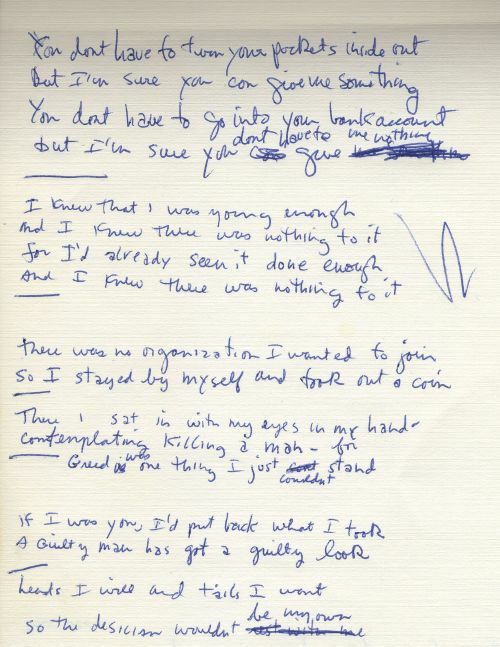 Exclusive: Bob Dylan’s Hand-Written Lyrics For ‘Nothing To It’ – Check ‘Em Out Now! Last year a box of lyrics that Bob Dylan had written during the summer of 1967 for songs that he never wrote music for, or recorded, was given to producer T Bone Burnett. Now, for the first time, we get to see what the original page on which Dylan wrote the lyrics to one of the songs that will appear on the Burnett-produced album Lost On The River: The New Basement Tapes, looks like. That song, “Nothing To It,” was released as a lyric video the other day. Examining Dylan’s page of lyrics, we can see how Jim James rearranged the order of the verses and chorus for his version of the song. So the changes Jim James made amount to starting the song with the chorus, then singing what follows after the chorus, then singing what for Dylan is the first verse, and then a return to the chorus. And there’s one other change. I’m looking forward to seeing what Burnett and his crew did with the rest of the lyrics. This one is an auspicious first song. Reminds me of the Wilburys; which is a good thing.